We see from the first passage that the neglect of little things exposes us infallibly to great falls; and from the second, that fidelity in little things ensures our fidelity in great things and is consequently a necessary means of mortification. We need only to understand these two thoughts well to be inviolably faithful on the smallest occasion. To develop this matter a little more, let us remark, in the first place, that, properly speaking, there is nothing either little or great with regard to the things of God. Everything that bears the impress of His will is great, however small it may be in itself. Thus, as soon as we are quite sure, by an interior voice, that God desires some particular thing of us, the infinite greatness of God does not allow us to regard as small or indifferent that thing which is the object of His desire. On the contrary, however great in itself a thing may be, were it even the conversion of the whole world, if God does not require it from us, any idea of the kind that we might form to ourselves would have no value in His eyes and might even displease Him. It is only the will of God that gives any value to things. In the same way, with regard to our sanctification, such and such a thing, which appears to us very little in itself, may be of so great consequence that our perfection, and even our salvation, may depend on it. God attaches His grace to what pleases Him. We cannot know of ourselves what may be the good or evil consequences of any single action that seems to us of little importance. Of what grace may I be deprived if I neglect it? What grace may come to me if I perform it? This is just what I do not know; in this uncertainty a constant and exact fidelity to grace is the only course to pursue. This article is from a chapter in The Spiritual Life. Now, great things and great occasions of heroic virtue are rarely presented to us. But little things are offered to us every day. And how shall we ever prove our love to God if we wait for grand and brilliant occasions? Perhaps one may never come to us all our life long. More than this, great things require great courage. How can we make sure of our strength in heroic actions if we have made no trial of it in small ones; if we have not striven and prepared ourselves by degrees for difficult things by the performance of those that are easier? Great things, also, cannot be accomplished without great graces on the part of God. But to merit and obtain these great and special graces, we must have been faithful to the smaller graces. Humility wishes that we look on great things as far above us and that we never of ourselves aspire to them; humility teaches us to attach ourselves to little things, as being more within our reach. Let us, then, perform our little and everyday actions with fidelity to our ordinary graces, and let us be quite sure that, when God requires greater things from us, He will certainly care to give us the necessary graces. The desire of doing and suffering great things is often — indeed almost always — an illusion of self-love and an effect of presumption. I would like to practice great austerities; like such and such a saint, I would like to bear great crosses: this is all pride, all vainglory. The saints never formed such desires. Now, what happens to us when we do? We try of our own will to perform great austerities; then our fervor cools down, and we give them up; then some very ordinary crosses present themselves to us, and our soul, which thought it could bear such great things, finds it cannot bear the very smallest. Let us desire nothing; let us choose nothing; let us take things just as God sends them to us and just when He chooses to send them to us; let us think nothing of our own courage and strength, but believe ourselves inferior to the weakest; and let us be persuaded that if God did not take pity on our weakness and did not sustain us by His strength, we could not advance a single step. And, as little things are constantly recurring, an exact fidelity to them requires more courage, more generosity, and more constancy than we would think at first sight. To do it perfectly requires nothing less than consummate virtue; for, indeed, it is a question of dying to ourselves at every moment, of following in all things the guidance of divine grace, of never allowing ourselves a thought, or desire, or word, or action that could give the least displeasure to God, and of doing everything, even to the simplest thing, with the perfection He requires of us; and all this without any relaxation, without ever granting anything to nature. In very truth, we must confess that in all sanctity there is nothing greater than this constant fidelity, nothing that needs a more sustained effort. There is much danger of self-love being mixed up with the great things that we do or suffer for God. There is much danger of our applauding our own courage, taking credit for it, or preferring ourselves to others. Little things do not expose us to the same danger; it is easier in them to preserve humility; in them there is nothing for self-love to fix on as matter for glorification; there is no occasion for comparing ourselves with others and preferring ourselves to them. Therefore, the faithful practice of little things is incomparably safer for us and far more conducive to our perfection, which consists in dying entirely to ourselves. Little things destroy and consume by degrees our self-love, almost without its perceiving the blows directed against it. These blows are slight; but they are so frequent and so varied that they have as much effect as the most violent blows. And even if the death of self-love is more gradual, it is nonetheless sure, for the constant practice of little things reduces it to such a state of weakness that at last it has no power of reviving. Therefore, it is generally in this way that God finishes our self-love. Sometimes, in the beginning, He may deal it great blows; but it is by these quiet and scarcely perceptible blows that He reduces it to the last extremity. The soul then no longer knows what to do; God seems to take away everything from it and to leave it naked and destitute. The soul no longer takes pleasure in anything; it seems scarcely to be doing anything; it remains in a kind of annihilation, in which God acts so greatly within it that it perceives neither the action of God nor its own. If the love of God seems to shine with more generosity in great sacrifices, it shows in little sacrifices, continually repeated, more attention and more delicacy. We do not love perfectly when we neglect small occasions of pleasing the one whom we love and when we do not fear to wound him by trifles. To wound the tender and loving Heart of God in the least thing will be for that soul a crime that will inspire it with the greatest horror. And to refuse anything whatever to God, deliberately and intentionally, under the pretext that it is nothing, is to fail in love in a most essential particular; it is to renounce our familiarity with God, our close union with Him; it is to deprive Him of His greatest glory. For it is in this that He makes His glory to consist — that is, that His creature shall never look upon anything as small that can please or displease Him, and that His creature shall always be disposed to sacrifice everything to His good pleasure. It is quite certain that we do not begin to love God with a love that is really worthy of Him until we have entered into these dispositions. I am not speaking here of our own interest. But it is easy to see that a soul that is faithful to its resolution of pleasing God in the smallest things will most assuredly gain the Heart of God; that it will draw to itself all His tenderness, all His favors, all His graces; that by such a practice it will amass at every moment inconceivable treasures of merit; and that, in the end, it will be capable of doing for God the greatest things, if He should call it to perform them. These are, it seems to me, quite sufficient motives to make us take at once the great and heroic determination to neglect nothing in the service of God, but to apply ourselves to please Him in everything, without distinction of great or small. Let us, then, make this determination once for all; and let us beg God that we may be faithful to it until our last breath. Nevertheless, we must take care to carry our resolution into execution without too much care or anxiety. Love wishes for a holy liberty; everything consists in never losing sight of God, and in doing from one moment to another just what His grace inspires us to do, and in turning away at once from anything that we know would displease Him. He will never fail to give us warnings in the interior of our souls whenever we need them. And when He does not give us such warnings, we may rest assured that there is nothing in what we have said or done that was contrary to His good pleasure. And if we do not allow anything to draw us from our recollection in Him, we cannot fail to know whether we have received any interior warning or not, and whether we have followed it. Thus, there is never the least occasion for us to torment ourselves unnecessarily. Editor’s note: This article is from a chapter in Fr. 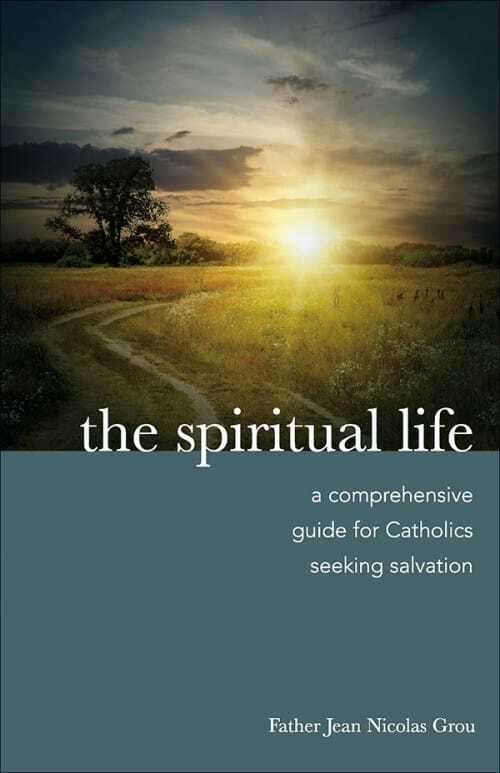 Grou’s The Spiritual Life: A Comprehensive Manual for Catholics Seeking Salvation, which is available from Sophia Institute Press. Fr. Jean Nicolas Grou (1731–1803) lived through times of tremendous turmoil, first as a Jesuit novice when Jesuits were surpressed, and later during the French Revolution. In his book, The Spiritual Life, are the fruits of his sufferings and prayers.